A claw toe is one of a number of different types of digital deformities of the foot collectively known as hammer toes. A claw toe can affect one toe individually or all of the toes concurrently. Claw toes can be described as a deformity in which the entire toe grabs the ground. All three joints of the toe are part of a claw toe deformity. Claw toes develop due to two types of imbalance in the tendons that move the toe up and down: extensor substitution and flexor substitution. For more information on claw toes, please visit our page on hammer toes. Claw Toe by Myfootshop.com is licensed under a Creative Commons Attribution-NonCommercial 3.0 Unported License. 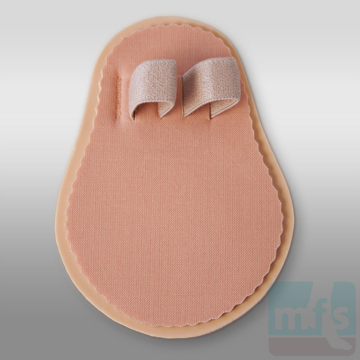 The Hammer Toe Crest Pad - Gel is made of soft, durable, medical-grade silicone. Great for lifting and supporting curled hammer toes, relieving stress on metatarsal shafts, easing pressure on toe tips, and eliminating forefoot pain. One size. Right/left specific. By Myfootshop.com. 1/pkg.